Reprinted from IndustriALL on April 13, 2017. It is unattributed. 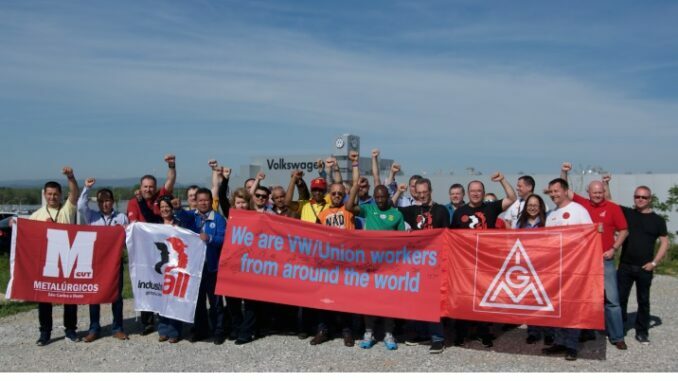 Unions from Poland, Germany, UK, Brazil, Mexico, South Africa, the US, and Switzerland convened in Chattanooga, Tennessee, to show solidarity for workers at the local Volkswagen plant. The German auto manufacturer is defying a court ruling and continues to deny workers their legal right to organize. In December 2015, an overwhelming majority of more than 70 per cent of the skilled-trades workers voted to be represented by IndustriALL affiliate United Autoworkers (UAW). Yet VW Chattanooga is refusing to bargain with UAW Local 42, even after the U.S. government has ordered the company to enter into negotiations.